Cate: Please welcome Russell Kaine to my special Halloween celebration. Russell, please tell us a little bit about yourself. Russell: Gladly! I currently live in northern AZ with my wife, several cats (which make great sacrificial items required by demonic entities, by the way) and a Chihuahua (not so much ... I’ve found demons don’t like dogs). I was born and raised, however, in Baltimore, MD. My High School English teacher, Mr. Parrott, is the person I give credit to for first inspiring me to write fiction. Since then, I’ve dabbled not only in writing and journalism, but have also enjoyed wonderful careers as a professional emcee, radio show host, respiratory therapist, occasional local TV personality, lumberjack, and a top-notch toilet paper replacement technician for public restrooms in Belize. “Bumble Bee” (not the tuna!) is my first full-length novel. Cate: Congrats! 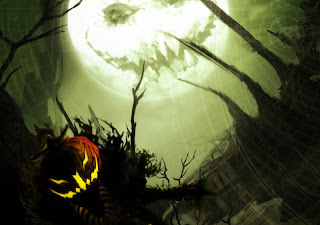 What do you love most about Halloween? Russell: Halloween is almost like Christmas to me in that when you start seeing pumpkins at the store and the obligatory decorations posted on random homes, it invokes a special feeling of fun and anticipation. It’s one of those holidays that takes me back to being a kid again. Back then, my favorite thing about Halloween was, of course, the candy. Nowadays, my fave about All Hallows Eve is good parties, watching great horror flicks and setting up fantastic decorations that frighten all the “Trick-or-Treaters” so that I can gorge on all the unspent candy myself. Oh ... and I still love carving pumpkins! Cate: Young Frankenstein's a must for us. Do you have a favorite memory of a Halloween past? Russell: Some years ago before my wife’s daughter (my stepdaughter) moved out, my wife was ill on Halloween and I had the wonderful responsibility of taking Rebecca out trick-or-treating. It was getting late –– probably around 9 or 9:30. Her friends were all busy or away, so it was just her and me. I suppose we could have just forgotten about it and watched a movie, but since I loved Halloween as a child, I was damned if I was going to let my stepdaughter sit at home with a costume for nothing. Just too depressing, that would be. We hit the streets finding most houses shut or without anymore goodies, but I persisted ... and it’s a good thing I did. The residents of one of the last houses we tried had over-bought on Halloween candy and, for whatever reason, didn’t have very many trick-or-treaters. We walked away with an ENTIRE garbage bag full of sugary sweets. Rebecca was in absolute bliss and I was elated to have been able to provide her with that. Later, she admitted it was one of the best Halloweens she’d ever had. Until we had to go see the dentist, that is! Cate: Not touching that one! :) What frightens you the most? Russell: Spiders, zombies, ghosts, that eerie feeling in the dark that something’s right behind you, and let’s not forget ... “Reality Shows” (or, more specifically, the people that watch reality shows ... they scare the crap out of me)! Cate: I’m not a fan of reality shows, either, unless you count travel shows. Ever gone on a ghost tour? Or ghost hunting on your own? Russell: I’ve gone on a few ghost tours ... most were quite amateurish and boring. However, I do remember the old “Insomniac Tour” they would conduct in Baltimore. A bus would start taking patrons around at midnight to all of the city’s greatest haunts, including the grave of Edgar Allan Poe. Now THAT was a ghost tour! Cate: That does sound cool. Any favorite Halloween recipes you’d care to share? Russell: As a tradition, my mother would take the seeds leftover from pumpkin-carving and bake them with salt. Not gourmet, but always a welcome snack. Aside from that, we never really had any special recipes for Halloween. When it came to that holiday, mom & dad would get pizza and send us kids out trick-or-treating afterwards. Of course, when you live on the East Coast, the pizza is always tremendous! Cate: Especially in Jersey, but I’m biased. Tell us about your release, and where readers can find it online. 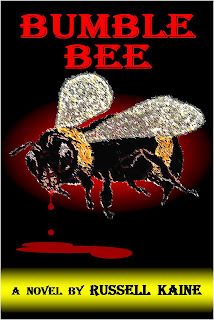 Russell: “Bumble Bee” is a fast-paced, action-packed rollercoaster ride of a horror story with a little bit of everything ... great characters, monsters, psychotic townspeople, true Southwest history, telepathy, supernatural elements, real locations, clairvoyance, creepy flashbacks, terrifying visions, Native American lore, a shade of romance, plenty of blood & guts, and even an appearance by a zombie. Once you start, you won’t be able to put it down! For a limited time, it is currently being published through LuLu.com and is available right now on Amazon, Amazon UK, Barnes & Noble (BN.com) and directly through LuLu. In March 2011, it will be officially released through Damnation Books/Eternal Press LLC. Look for it online or in bookstores! “Ray, you’re hurting me! STOP IT!” Linda shouted at him, but he didn’t flinch. With his new strength, he pushed her down to a kneeling position before the hives. The bees were buzzing more angrily and frantically now and started landing on Linda Dobbins’ face, neck and chest. She kept trying to wrench herself away, but couldn’t. As the bees stung at her, she blasted out a scream that no one else but Ray Fleck heard, then she fell silent in an apparent daze. After a few minutes, he didn’t need to hold her down. She was swaying lightly and humming something, probably an old childhood song, and totally taken over by the same madness that had overcome Ray Fleck. She got to her feet and smiled at him. “You were right, Ray. It’s wonderful,” she said while nonchalantly chewing at a few bees that had gotten into her mouth. Over the next three hours, Ray Fleck and Linda Dobbins gathered a few more select Bumble Bee residents and took them to the hives, one by one. They all screamed once. Cate: Creepy! In a good way. What inspired you to write about the theme? Russell: Being an avid fan of the genre, I couldn’t help it. I had been through the ghost town of Bumble Bee, AZ, many times and couldn’t help but think, What a natural setting for something creepy. “Bumble Bee” began as a short story, but as stories often do, it took on a life of its own and became a novel. Russell: Advice for other writers ... Don’t give up! Keep writing!!! Cate: Excellent advice. You guys can check out Russell's web site here. Thanks for sharing in the Halloween fun, Russell! Best of luck to you.